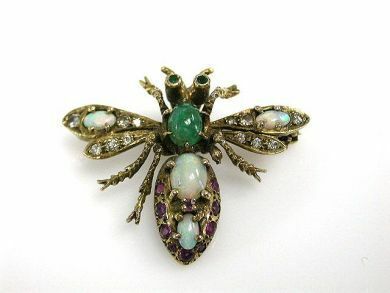 One 14 karat yellow gold bee brooch. One emerald (0.85 carats). Four cabochon opals (1.11 carats). Ten rubies (0.42 carats). Twelve round brilliant cut diamonds (0.29 carats: SI clarity: J-K-L colour). Two emeralds (0.05 carats).